Travel through time and experience the evolution of the guitar from the 1920s through the 1970s with our permanent collection of guitars. Let us take you through the origins of rock and roll from gospel to blues to R&B to the sounds of Motown and the invasion of the British. See and hear the impact of surf music and the rural acoustic music of country, bluegrass and folk. Each exhibit features the guitars that made the music as well as the stories and artists that brought them to life. Travel back in time and surround yourself with nearly 100 historical instruments, each with its own story and memories. 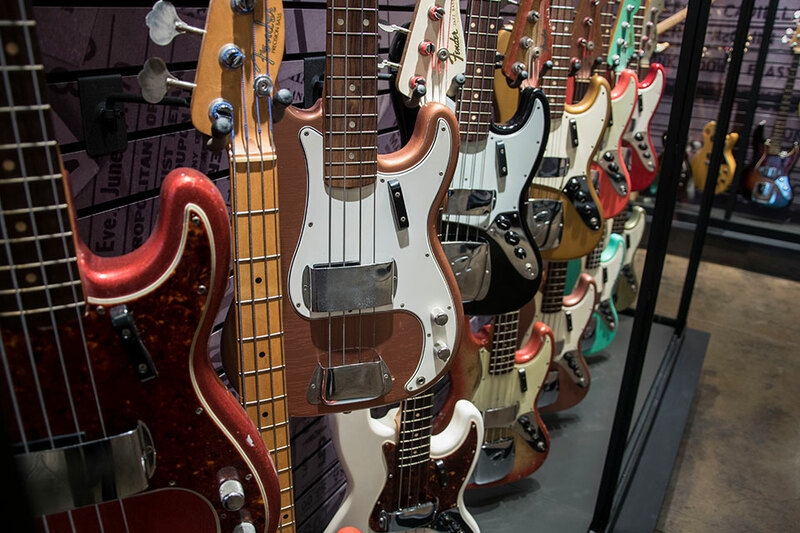 These are some of the most pristine and preserved guitars. Famous in their own right, these guitars have been played by some of the best musicians in history. See the guitars that created what is now the history of American music. Our North Stage is inside our modern guitar museum, providing a more intimate listening room experience for up to just 200 guests with a full-bar and seating. The South Stage can hold more than 500 guests with a full bar and lounge area, a brand new sound system and lighting, and VIP seating.